As more and more homeowners cannot afford to ignore the need for hot water for their daily usage, water heaters have taken the center stage. There are excellent water heaters in the market for you to choose from. However, the availability of numerous brands and models makes the process of finding the best quality somehow tedious, especially for the inexperienced customer. Bosch 330 PN Tankless Water Heater is a unique product that has made such a great impact which has tremendously increased its popularity among many homeowners. While there are many points to consider while searching for the best product, this Bosch 330 PN Review will solely focus on the model and why it’s such a great buy. When searching for a suitable product, the first step is to do the feature comparison between different items. 1. 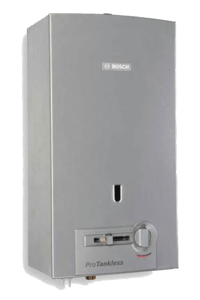 Low Flow Rate: Bosch 330 PN tankless water heater is designed with an activation flow rate of about 0.5 gallons per minute, this makes the water heater perfect particularly for areas that experience low flow rates. Nevertheless, the system still has the capacity to produce about 3.3 GPM and has a maximum BTU input of 75,000. 2. Constant Temperature Control: With the varying seasonal climatic conditions, it is vital for your water heater to be able to cope effectively. Bosch 330 water heater has a modulating gas valve attached, to regulate the system’s heating temperatures. Furthermore, it has the ability to maintain constant temperature regardless of the flow rate. 3. Compact Size: If your home is short on space, then you’ll appreciate the size of this special tankless water heater. Bosch 330 is quite compact with dimensions of 10.5 X 18.5 X 36.8 inches and weighs about 20 pounds. This particular Bosch model is fully assembled before selling and its compactness makes its installation quite easy for the DIY process. 4. Use Both Natural Gas and Liquid Propane: Bosch 330 therm tankless water heater offers two choices; one that uses natural gas and the other liquid propane. With the availability of natural gas and the escalating cost of electricity, you wouldn’t be worried about this Bosch model serving your home’s hot water needs. 5. Warranty: A warranty can point to you an excellent product from the rest. Bosch as a company backs its products with a 2-years warranty on parts and 15 years on the heat exchanger. Galvanized B Vents: This allows a natural draft. Thermal Efficiency: The heat loss is manageable which makes it have such an amazing thermal efficiency score 78%+. De-scaled Hard Water: The perfectly designed heat ex-changer easily de-scale your water and removes mineral deposits. In essence, it improves the tankless water heater performance including its durability. Limited Production Capacity: As mentioned earlier, Bosch 330 has a maximum production of 3.3 gallons per minute. If you need more capacity, then you’ll fall short. Single-Point Application: Bosch 330 PN is suitable for a single bathroom or one point of application that needs a lot of hot water. Unfortunately, you can’t serve such applications simultaneously. First-time users of the Bosch 330 PN therm tankless water heater appreciate that it is much easier to install compared to another popular water heater. Most customers appreciate the compact size which is compatible with a 0.5-inch gas line. Customers have also confirmed their satisfaction with the simple temperature control panel. They stated that it was easy to control the system’s heating temperature. Most users also appreciate the model’s ability to maintain temperature as set by the user, regardless of the surrounding conditions. One of the major issues noted from customer review point is the product’s inability to handle more than one faucets concurrently while still offering the same power, pressure, and performance. More clients are happy with the general performance of the Bosch 330 PN tankless water heater in regards to its price. In essence, it has proved to be worth every penny. Bosch 330 model users also mentioned that the product is quite durable with the vent galvanized it actually stays strong for a long period of time. In a particular case, a customer did replace his Bosch 330 PN after 8 full years of service. Not so bad if you think about it. You have already noted the numerous models that are available in the market. While there are a number of things to consider while shopping for tankless water heater – Bosch 330 PN water heater will be an excellent choice if; you have a cabin of the grids, don’t have much space at your home, and on a budget but still in need of a quality product with excellent performance score. There is no doubt that there are plenty of tankless water heaters to choose from, and you might have a difficult time trying to pick the best product without a reliable guide, but with this Bosch 330 PN Review; you can easily compare a variety and choose a suitable product.